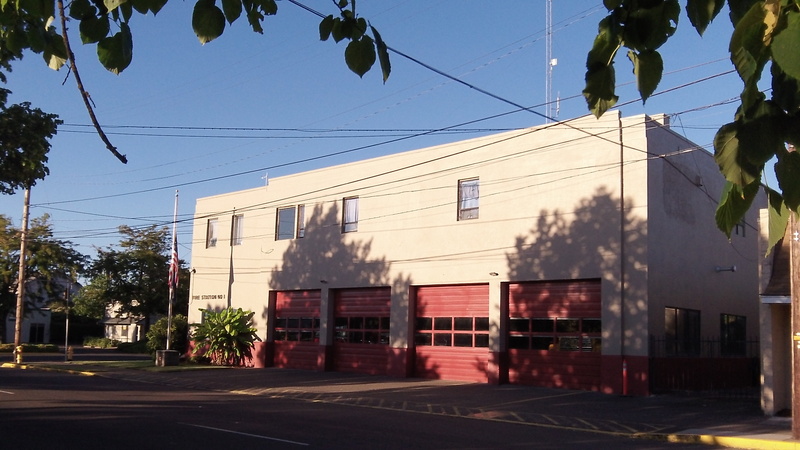 Fire station 11 would be replaced in the same location but on an expanded site if voters approve the proposed police and fire building bond issue. The Albany city staff is following through on a pledge made by Wes Hare, the city manager, in connection with the scheduled Nov. 5 bond election for a new police station and main fire hall. Before the city council put that $20.3 million bond on the ballot, Hare said he would recommend that approval of the proposal would not benefit CARA, the downtown urban renewal district. Now Hare, the city attorney and the urban renewal manager have figured out a way that the pledge can be carried out. They’ve asked the council — acting as the urban renewal board — to adopt a resolution when it meets Wednesday (Aug. 21). The resolution says CARA will either not levy whatever amount it would otherwise receive from the bond taxes — estimated at $50,000 the first year — or spend that amount on a project that the taxing district, the city in this case, would otherwise have to pay for. From Tom Cordier: Thanks for keeping us informed. I hope the commitment to exclude CARA from bond monies will apply for all years the bond is in effect. I also suggest that both county assessors be consulted on the language of the exclusion. They are the people who actually collect and disperse to monies, so the tweak must be able to actually be implemented and certify that it was done. From Gordon L. Shadle: I’m happy to hear that the CARA folks will do what is right and underlevy the new bond. But they appear to be doing it for political expediency (enhancing the chances of bond approval). They should be doing it because it’s the right thing to do. Will they do what is right by the voter on the other voter-approved measures? CARA should underlevy for the Linn County Local Option Levy (law enforcement), Linn County Vets’ Home Levy, LBCC Bond, GAPS Bond, City Local Option Levy, 4H levy, and the existing City Bond. CARA’s skimmed over $600K last fiscal year from these voter-approved taxes. Voters didn’t approve the skimming. The ARA/Council should do what is right, not what is marketable. A choice! The city has a choice! Either not levy the money – and therefore not be able to spend it, or, spend the supposedly “under levied money” on something that CARA would not ordinarily spend it on! C’mon now!? What choice do you honestly think they will make? This is nothing more than a bait and switch monologue spewed by our esteemed Wes Hare. As the city spends the “unlevied” money they can stand back mystified at concern and honestly say, “we did exactly what we said we’d do – we lived up to our agreement – you misunderstood”. They’ll blame their loose spending on us! This is a typical tactic leftists use to squander our money on pet projects. This is a typical tactic to obfuscate and belittle the voting public. They do NOT want to live up to the spirit of the measures Albany passed, so they scheme and connive, finding ways around them.